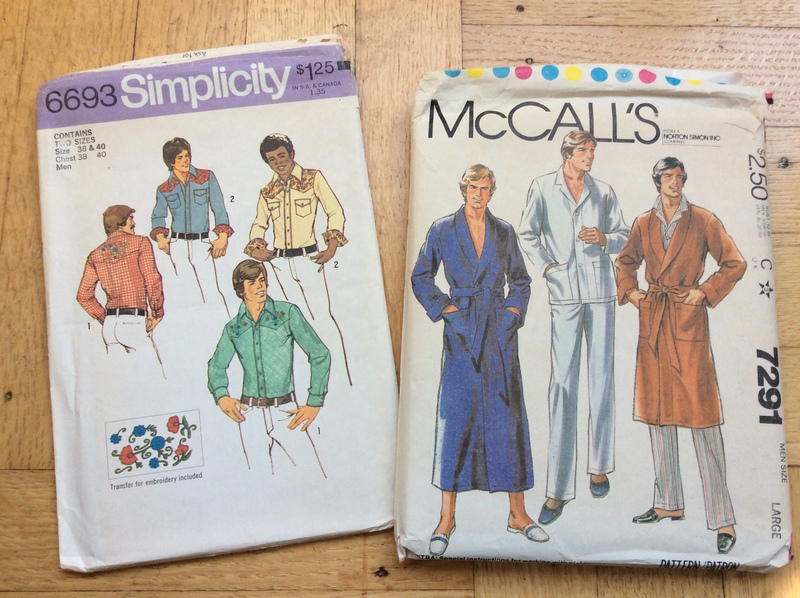 All jokes about the Bruce Jenner outfit aside, the other swimsuit patterns in Simplicity 5046 would look quite contemporary if made now, especially views 1 and 3. 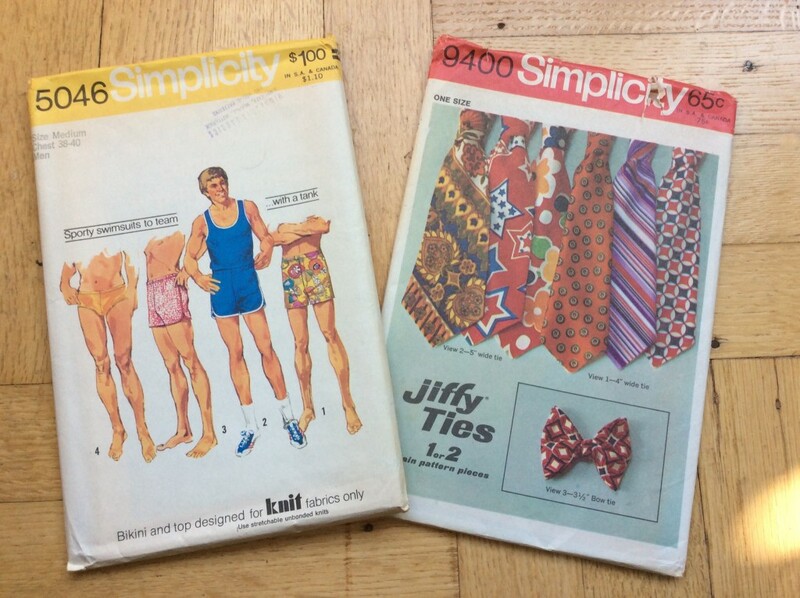 The ties in Simplicity 9400 are wider than Montana, and I probably won’t make this pattern for my upcoming Tie project because I’m not sure the “E-Z” approach is going to lead to a nice-looking result. Still, it’ll be fun to study the pattern to see how they went about constructing it. Simplicity 6693 looks like it could be a winner; I haven’t thought about making a western-style shirt before, but this one has some nice details including an embroidery transfer sheet. I’m curious to see how embroidery was done before we had machines that stitch out a fully-baked design at the push of a button. I have some cuts of Chambray fabric that I’ve been storing for a future project, so some of those might go towards this pattern. 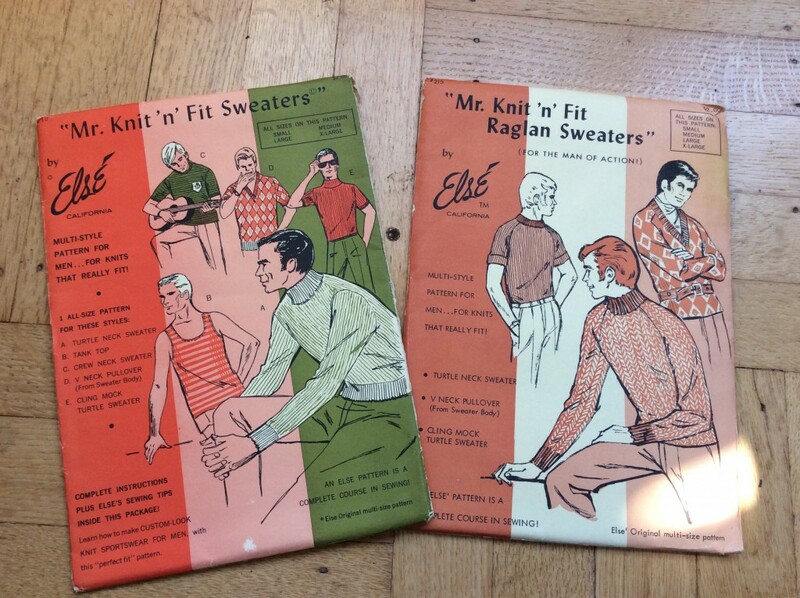 I also got some sweater patterns, which look like a real treat. I had sort of thought about making a project with sweater knits, and I was impressed by MainelyDad’s recent experience making his Phony Missoni sweaters at his blog, The Japanese Pattern Challenge. So maybe now I have some inspiration to make my own sweater! The raglan-style sweaters look the most interesting. 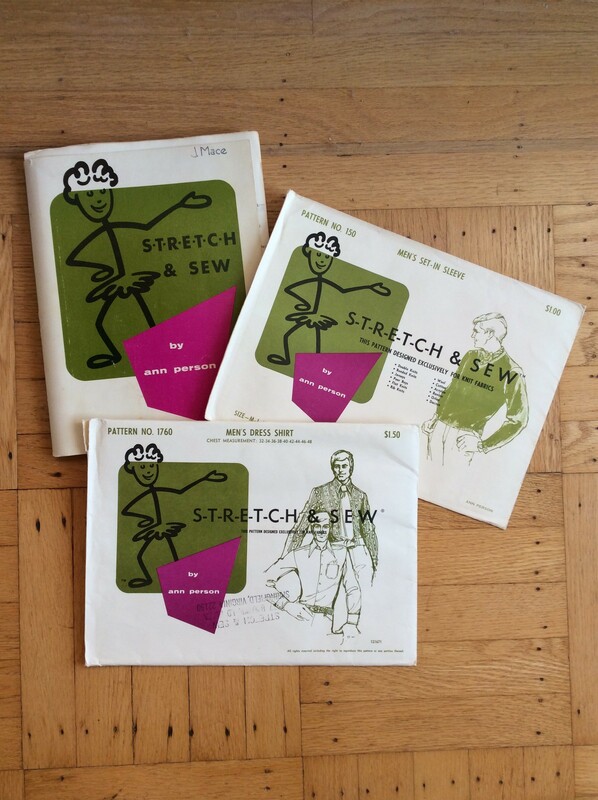 If that weren’t enough in the way of sweater patterns, I also got two vintage Stretch & Sew patterns along with a full instructional guide to the Stretch & Sew technique. From what I gather, Stretch & Sew was a popular pattern brand in the 70s that specialized in knitwear. Ann Person developed her own techniques for sewing knit garments on a conventional sewing machine – in the days when zig-zag machines were less common, and before sergers were available to home sewers. The centerpiece of Person’s technique was to use a longer-than-normal straight stitch, and to stretch the knit fabric as it went through the machine. After the fabric recovered from the stretch, the stitching also had some “give” in it to stretch along with the fabric when the garment was worn. I got two patterns, a sweater pattern with set-in sleeves and a dress shirt pattern. The sweater pattern also has design variations to sew it up as a cardigan. I’m not sure if the dress shirt pattern uses knits or if it is in fact for wovens. 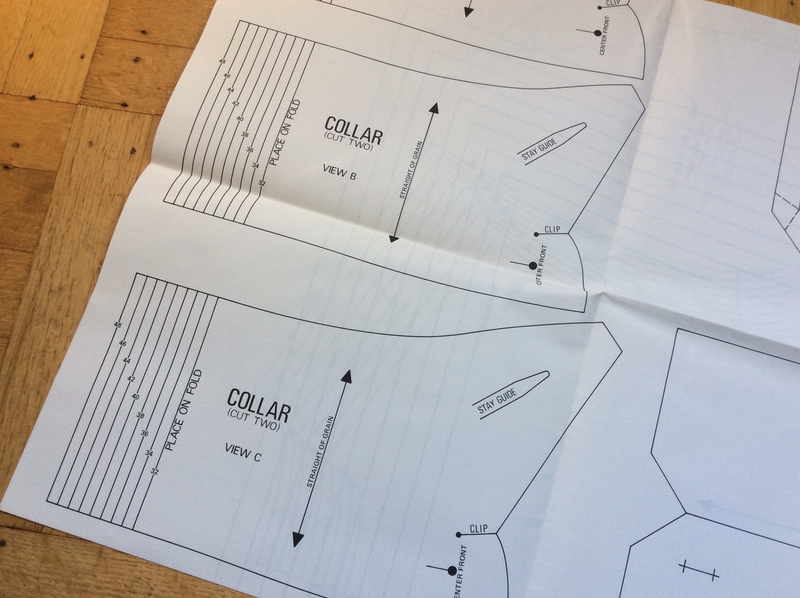 The pattern instructions are not definitive on this matter; the yardage chart has a note about extra fabric needed for bias collars, but the instructions contain fabric care advice for knits. Clearly a muslin is in order to sort this out. 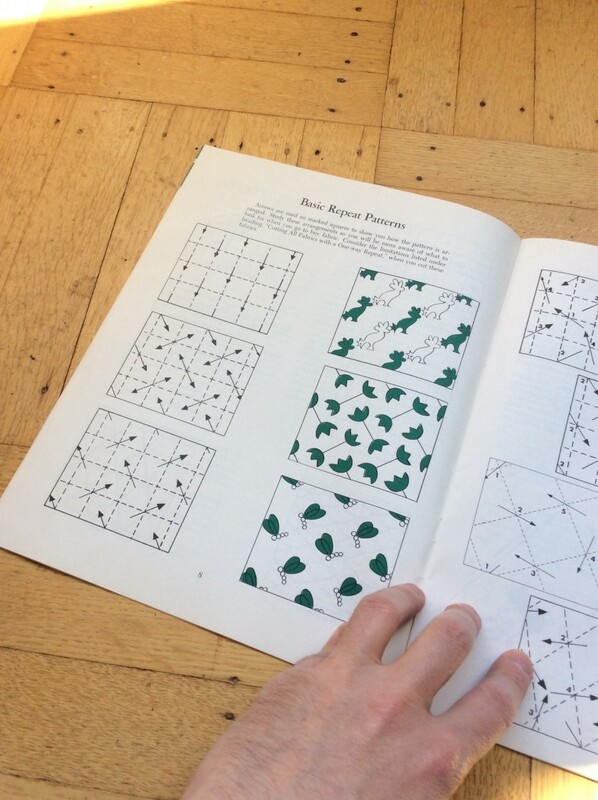 One thing I have heard from Judy is that we have it good in the age of the internet when it comes to sewing instruction; in her heyday, she got a lot of her sewing knowledge from pamphlets and photocopied handouts. 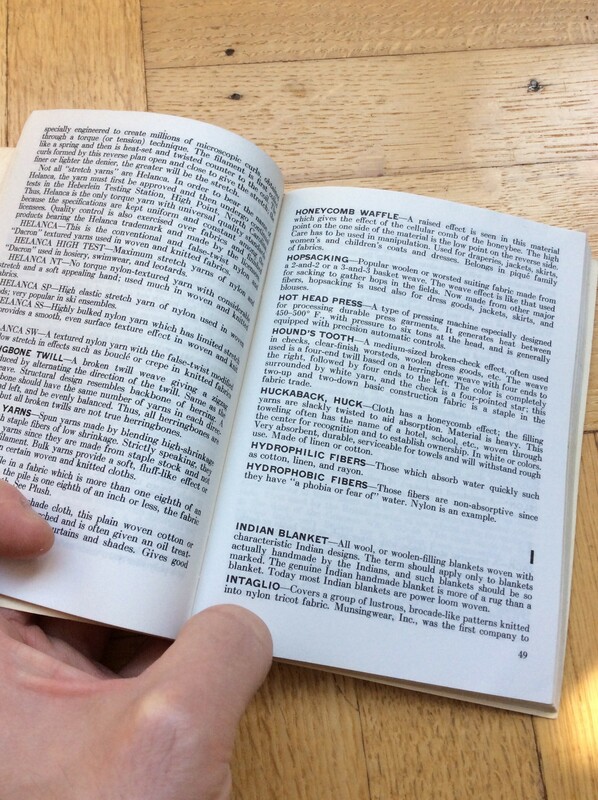 She included some period instructional materials that are fun to leaf through. 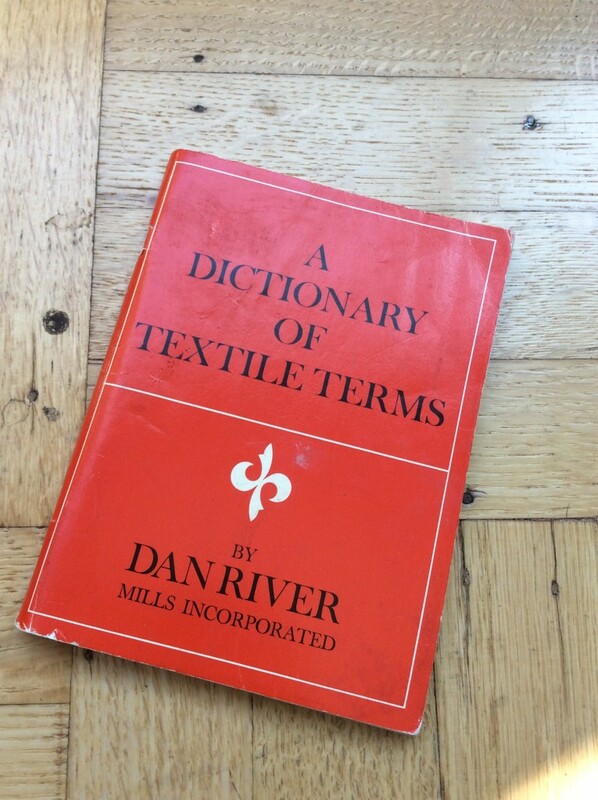 I also got a really nice dictionary of fabric and textile terms. All this stuff is fascinating from a historical perspective, as well as being instructional and useful. What fun! I’l pick up on the Weekend Duffel project. Major progress to report. Happy birthday mate, that’s a great pattern selection you’ve got there! Enjoy! So happy to read your post. Ah! the seventies… Great memories. 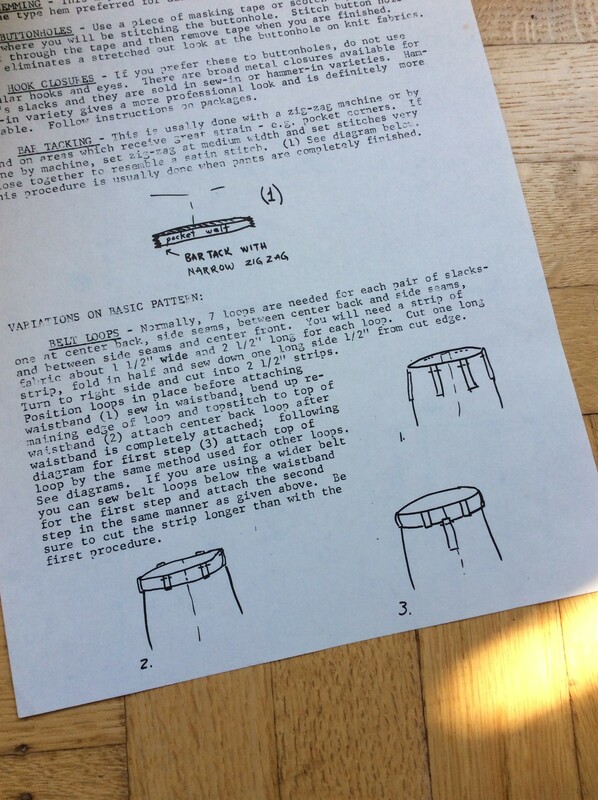 My mother sewing classes had mimeographed instructions ( a printing machine with an ink-fed drum). She guarded these things like gold. Of course I though it was such fun to watch her struggle with patterns. Fast foward to today and here I am. Googling everything. Is there such a word? At least I do not have to wait for the snail mail to deliver my correspondence sewing course. Now I feel like I am a collector item. In a good way. Happy birthday, from a fellow 2/25 birthday sewist. Except that I ended up working all 14 of my 8 hours today at work. Hope your work clears up soon! Happy fellow birthday. Spouse sewing has arrived! I love it! 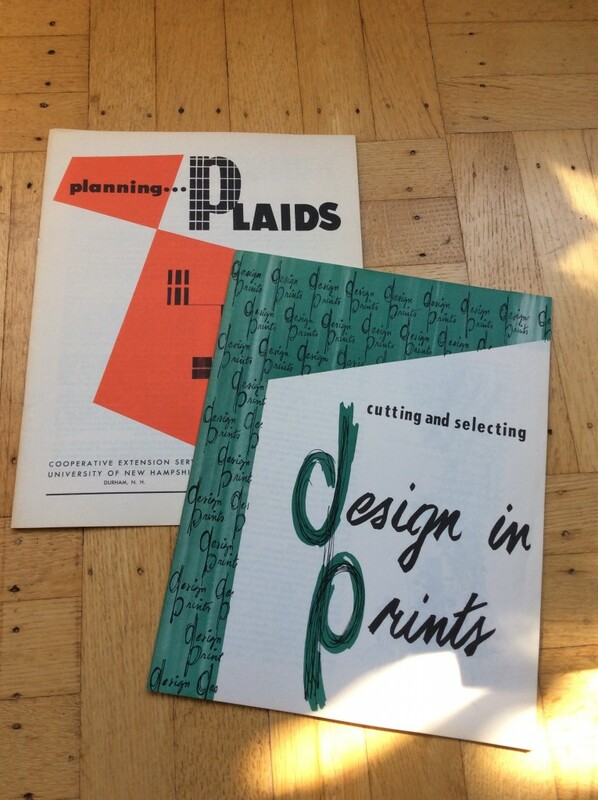 What a great batch of patterns and booklets. I think you could totally rock the western shirt. It’s a classic. And thanks for the shout out to my crazy blog. I’m not sure I’m going to do the embroidery, but I think I do want to give the shirt a try! It is one of the standouts from a really good set of birthday gifts. Happy Birthday. Nice birthday gifts! Wow! 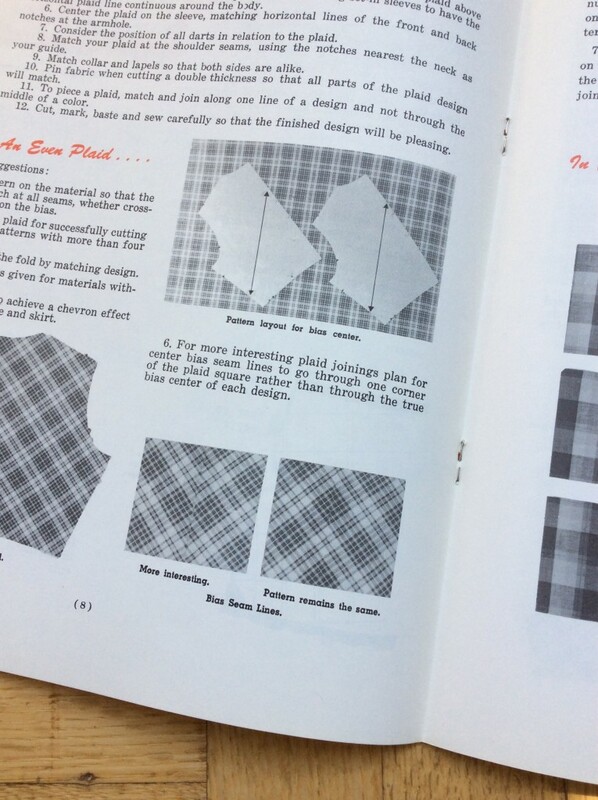 What old memories that Simplicity Western shirt pattern brings back. 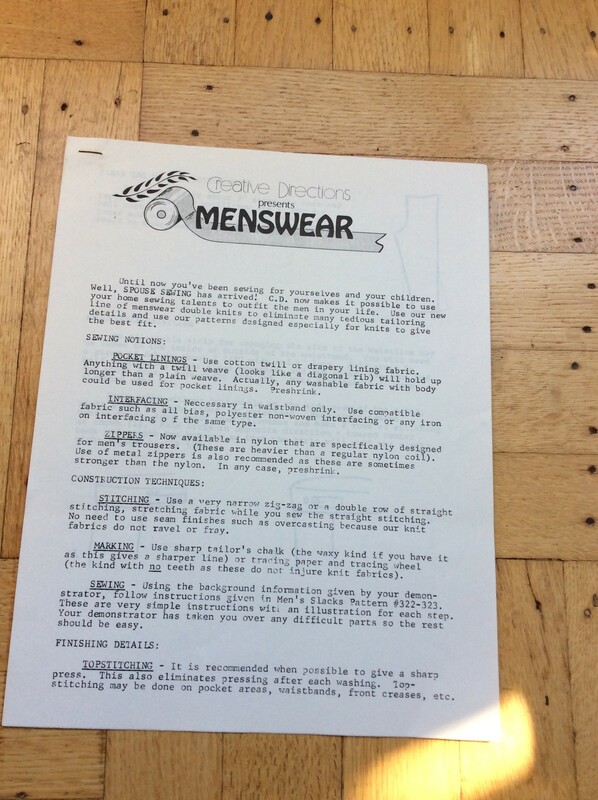 Back in the ’70’s when I first began sewing, that pattern was the first shirt I ever made. The bodice was a knobby, muslin- like, natural color fabric, and the yokes were a brown calico. I remember wearing it to a local dance club, complete with jeans and boots, a la ” Urban Cowboy.” I asked about half a dozen girls to dance, and after being disdainfully sneered at and rejected by every one of them, I slithered out the door and went home. The homemade, calico cowboy was not a hit that night! I think I have improved my shirt construction skills since then. Thank you for sharing that really great story! I think I’m almost obligated to make this pattern now!